This species is accepted, and its native range is Malaya. Clustering high climbing moderate rattan with stems reaching 30 m tall. Stem without sheaths about 1 cm in diameter, with sheaths to 2.5 cm; internodes to about 20 cm long. Sheaths dull green, rather densely armed with slightly upward pointing hairy margined pale based brown spines of various lengths, the longest to about 2.2 cm long by 5 mm wide, with only slightly swollen bases, and sparse dirty brown indumentum. Ocrea brown, tattering. Knee prominent. Flagellum to 2 m long. Leaf subcirrate to about 1.3 m with petiole to 10 cm, armed with conspicuous black lateral spines to 4 mm. 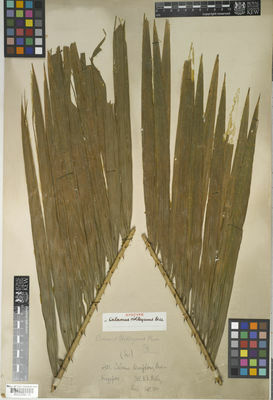 Leaflets regular, about 40 on each side the longest to about 40 cm long by 2.5 cm wide, bristly along mid-vein below, no bristles on upper surface; leaflets decreasing to minute vestiges to 1 cm long at the subcirrate leaf tip. Inflorescences to about 2 m long with 3 partial inflorescences, the female much more robust than the male with all bracts except those of the rachillae, armed with small thorns; partial inflorescences to 40 cm long; female rachillae about 8 cm long distinctly recurved. Ripe fruit unknown; immature very conspicuously beaked, covered in 28 vertical rows of dull brown scales. Seedling leaf unknown. 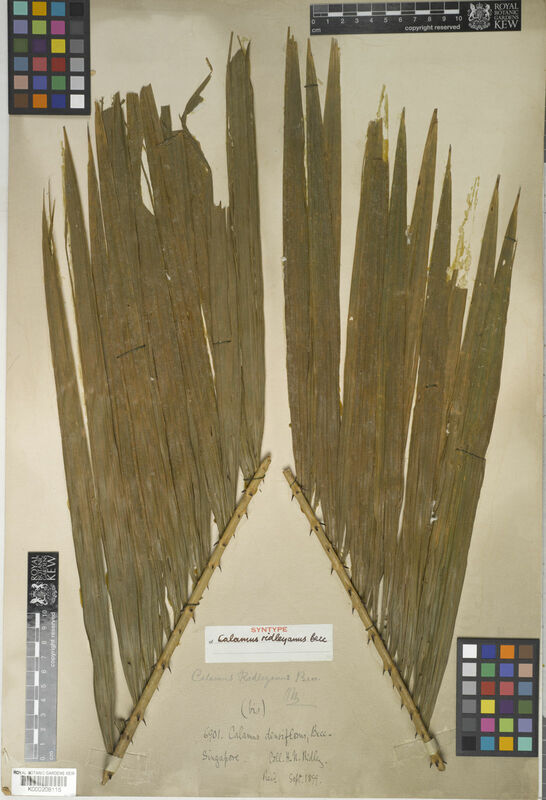 Not known but probably used mixed with Calamus densiflorus as rotan kerai.